While many people think that a roof inspection is not something that is really necessary, it does provide certain advantages. As professional Simsbury roof inspectors, we at Brian O'Donnell Quality Home Improvements, Inc. have often been asked why and when they would be needed. It makes sense to have a roof inspection prior to buying or selling a home, but what else are they useful for? Isn't this a frivolous, unnecessary cost? Well, perhaps some do see it that way. After all, why take the children to the doctor for a physical checkup throughout the years, or why prevent plumbing leaks, house fires, and flood? A roof inspection helps to prevent problems that lead to leaks which in turn lead to significant problems for the house and the homeowner. It is much the same as going to a doctor to prevent sickness by catching the signs early and taking care of any problems before they cause significant illness. The general consensus is that a regular roof inspection should be done about every two to three years depending on the age of the roof. Also if you suspect storm damage, a roof inspection is in order. By catching roof leaks early, you prevent rotting of the building materials underneath and protect the home from mold, mildew, and insect or rodent problems. Here are some other reasons that homeowners call us to do roof inspections in the Simsbury area. If you plan to buy or sell a property, it is always best to have your own roof inspection done. When you hire the inspector, you know you are not getting a biased report about the roof's condition. If you are selling, the professional roof inspection will give potential buyers the information they need and it will help you determine how far to negotiate if repairs do need to be made. If you have roof damages in the Simsbury area from storm damage or other natural causes and you are intending to file an insurance claim or plan to apply for financing, a roof inspection report is a vital document. Your insurance company will send out a roof inspector, but it's always wise to have your own roof inspector who will provide you with the details about the roof damage and what it takes to get it repaired with a local estimate. A professional roof inspection will give you a detailed written report to submit to the insurance company or financing agent. But we at Brian O'Donnell don't stop there. We work with your insurance company, the adjuster, to ensure their information is as accurate as possible. You will have our professional support throughout the whole process of insurance claims and roof restoration. If you ask us what sets certain roofing contractors apart from competitors, we can tell you that a good inspector has a thorough and complete understanding of every type of residential roofing system there is. They will know all the local, state, and national building code requirements and how to look for defects in the installation and repairs that were done in the past. In order to do inspections, the Simsbury roof inspector will need to be highly educated about roofing systems, the problems that can occur, where to look for them, what is needed to fix the problems, and all the details of what it should cost. The homeowner also needs an honest roofing contractor for a roof inspection so they can trust the results. 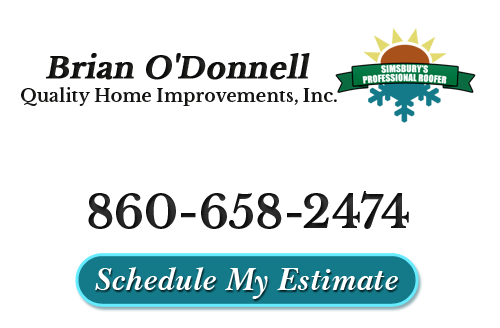 Brian O'Donnell Quality Home Improvements is a family owned and operated roofing company with our principal master roofer having over 39 years of experience in the roofing industry. Our company is a reliable and dedicated team who has served the Simsbury and surrounding areas since 1978. With our roof inspections in Simsbury, you can count on having a service professional with the expertise and good values to provide an honest assessment that you can trust. If you would like to know more about or schedule your Professional Roof Inspection in the Simsbury area, please call 860-658-2474 or complete our online request form.